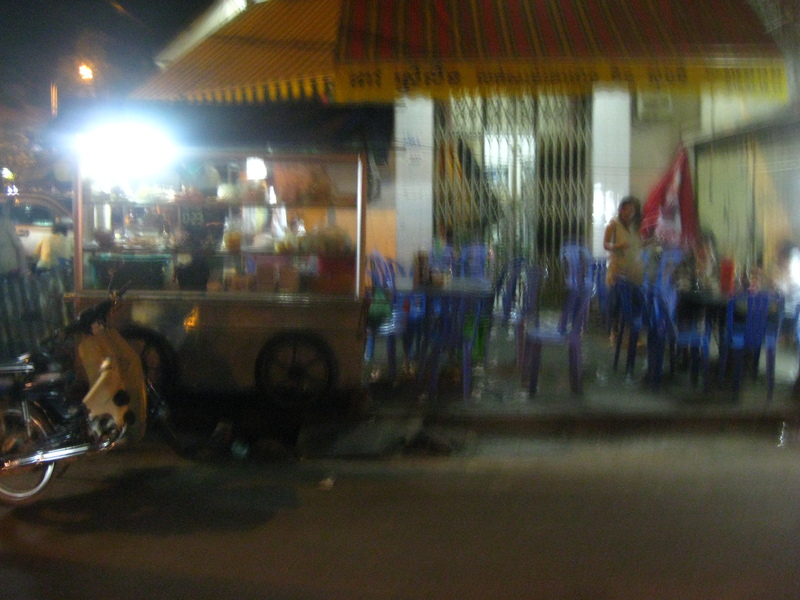 You think of the boy who you talked to for an hour over a bowl of soup in the bright dark of a Phnom Penh night. After standing for a while, lurk and stare, before the glass and metal street cart with its hot metal vat of liquid steaming. You’re watching the man’s fluid motions as he cuts the meats, trying to figure out if the food is good or sanitary or hopefully both. The boy sitting under the small colored lights, offers a helpful, “Good.” A stranger’s advice, but you trust it. Two folding metal tables, the ubiquitous red plastic chairs, chopsticks and cheap metal forks and spoons in cups of hot water. A roll of toilet paper that serves as the napkins – a familiar corner scene replayed in every city you’ve been in on this trip. You ask the price because you can’t help yourself and that’s what kind of traveler you are. “6000 riel.” In US currency, a dollar fifty. You sit down across from the boy and take out your chopsticks, rolling them between your fingers while the man chops, adds, and pours behind you. The first exchanges between you and the boy are the expected: where from, how long here. But then you’re talking about his life and what he wants to do when he gets older. He tells you he’s taking his high school exit exams tomorrow and then next year he’ll be starting university studying medicine. He tells you he wants to be a doctor. English he learns from a book by himself at night. You’re trying not to stare at his face. He looks older than he is – 17 – but once you start talking to him you realize there’s this quality about him, a boyish warmth perhaps, something generous and sincere. His black hair falls flat just above his eyes and he laughs easily. You talk about your families and music and places in America he’d like to visit. You talk until the man with the cart rolls back the awning from over the corner and turns off the red and yellow lights strung above you like small lanterns. The moment you go back to later on happens when you try to pay him a compliment. It starts with you talking about your girlfriends. You don’t think the word “complicated” will make it across the language divide, so you say “beautiful.” He shows you his girlfriend’s photo on his cell phone. She’s smiling just as he’s smiling when he shows it to you. “Beautiful,” he says too. “Is she as bright as you?” you ask. He doesn’t understand at first, the compliment phrased as question. You repeat it. Each time it loses a little of its intent. You think there’s something mysterious about the desire to offer a compliment to a stranger. There’s no aim of getting something back. Eventually you simply tell him you are impressed by him. The kindness isn’t deflected or part of anything else. You’re not sure why this is hard to say directly. Are you afraid you’ll embarrass him? Or that if you name the intimacy it’ll be gone? Or maybe you’re just afraid of a certain kind of openness. “No, I’m just good at –” he struggles for the word. “mathematics.” You disagree. saying again how bright he is. Then he disagrees. The topic of conversation changes to sports. You think of this – of the soup you couldn’t finish, of his offer to pay, and then your offer to pay, and the moment he lets you, of his insistence on walking you back to your guesthouse since it can be dangerous at night, of his insistence that he’ll call you after you give him your number and email. You think of all of this because you’re standing in Tuol Sleng, a high school turned by the Khmer Rouge into a detention and torture center and, years later, turned into a genocide museum. In the rooms after the rooms of wood beds and rusty leg irons, are the photos. You’re looking at rows of faces, black and white, of boys his age, men yours. Old women and toddlers, teenager girls and middle-aged men, all the faces in the haunting capture of shock and fear. You’re thinking about the fact that he, the boy, and you, and most people you know and love, people who care about books and ideas, science and languages, teaching and learning, anyone educated would’ve been murdered. A face isn’t a number, isn’t a textbook, and beyond the rows, more rows. Stopping to catch your breath, you keep walking through the levels and corridors, the neatly arranged exhibits, reading the placards with the facts and stats of history. You leave. The air is hot and you’re hungry and all around the gates men with motos and tuk tuks call to you – ride, ride, ride. Later that evening, in another tuk tuk, flying through the chaotic neon rush of the streets, you realize the question you’ve been unintentionally considering, and trying to answer. It was a question from your mother, maternal and expected, which she’d sent as a response to your email saying you’d be turning east instead of south, going to Cambodia instead of the beaches of Thailand. She asked: “Why?” Why go? It was for this, you want to say, the tremendous and inexplicable and surprising, the taste of hot soup on the front of the tongue and pain beyond pain in ghosted cells and rooms, the crowbar of history and the possibility of youth, the mystery of affection, the incomprehensible motion of a city, the moment of tenderness between strangers, unearned, quiet. Joshua Rivkin lives in San Francisco. Wow. Stopped dead in my tracks by this one, stunning. Strong work. The structure creates a very powerful effect, the way that the three stories all converge at the end: “man meets a stranger”, “man on a journey”, and “man’s conversation with his mother”. The fact that each successive story is shorter than the one before, adds to their cumulative power.